Birmingham’s Samford University takes home the Yellowhammer State’s top spot in the inaugural Wall Street Journal-Times Higher Education survey of more than 1,000 U.S. colleges and universities released on Tuesday. Samford ranked the top university in the state, while ranking 218th overall out of the 1,061 U.S. universities and colleges considered. The ranking is drawn from 15 performance indicators in four categories — student outcomes, school resources, student engagement and the learning environment (diversity) — that have been selected in order to answer the questions that matter the most when choosing a university. Forty percent of each school’s overall score comes from student outcomes, including how they fare after leaving campus, 30 percent from the school’s resources, 20 percent from how well it engages its students and 10 percent from the learning environment. 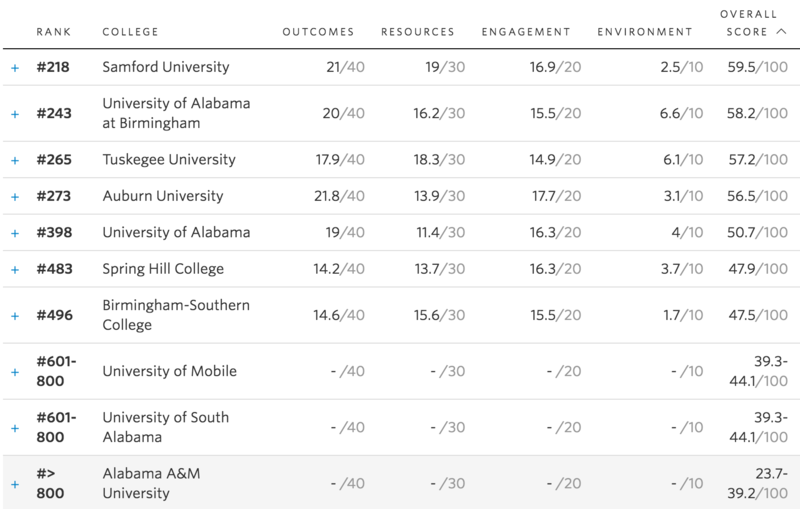 Samford scored highest in student engagement, based on survey results. The university also has a three-year average of 93 percent of its undergraduates having jobs or being in graduate school within six months of graduation. Samford’s student-faculty ratio is a relatively low 13 to 1. Samford University is in the City of Homewood, not Birmingham, this is one reason Samford is a very safe community/college. As a Samford Alumn, booo to this comment. Homewood is a part of Birmingham and thus Samford is a part of Birmingham. As much as racists want to draw a line between Birmingham and whatever suburb they are from, it is stupid to see any suburb as being separate from the entire community. Homewood and Birmingham (and Samford) are all linked in success and failure. You are not better because you live in a city with a different name so STOP trying to divide us.